Semiconductor Engineering - Is Cloud Computing Suitable for Chip Design? Semiconductor Engineering - Is Cloud Computing Suitable for Chip Design? Home > System-Level Design > Is Cloud Computing Suitable for Chip Design? Semiconductor design lags behind other industries in adopting the cloud, but there could be some good reasons for that. Change is difficult. Is semiconductor design being left behind in a cloud-dominated world? Finance, CRM, office applications and many other sectors have made the switch to a cloud-based computing environment, but the EDA industry and its users have hardly started the migration. Are EDA needs and concerns that different from everyone else? We are starting to see announcements from EDA companies, but few cheerleaders are ready to announce that they do design in the cloud. So what are the benefits to be gained by a migration to the cloud and how do you maximize performance? Fig 1. Compute requirements over time. Source: Cadence. Either way, there are costs. “You have to look at the capital investments, the budget models and ask, ‘Am I prepared to access this variable capacity?’ It is dollars from a different bucket—operational dollars, and reduced capex, or doing some combination of those two,” said Siva. To know what makes sense requires a certain level of financial modeling. The two primary pieces to this are cloud pricing and tool pricing. Within cloud pricing, there are various ways in which the cloud providers are charging for their services. These are a combination of compute, memory, disk costs and bandwidth used. When I managed the compute platform strategy at Synopsys, I was mostly skeptical of EDA moving to the cloud. Over the last few years, I’ve seen the cloud and the industry mature and now I think there are benefits. However, I think the benefits for semiconductor design in the cloud are complicated. There’s no one answer for everyone. For some organizations, the benefit will be to make sure that your EDA licenses are fully utilized. Licenses are much more valuable than compute, so if you wind up spending a little more to make sure your licenses aren’t idle and are running on the fastest machines, you probably come out ahead. You want to be license constrained. Mike Gianfagna mentioned tape-out. For many organizations, tape-out can be disruptive. Not only does IT have to marshal enough machines for the extra load, but other groups are sometimes de-prioritized from the farm to accommodate the extra load. Bursting to the cloud could help alleviate some of this. Bursting tape-out also bring up other possibilities. Customers often obtain extra licenses for tape-out. Depending on the critical path in your verification, you could potentially get twice the number of licenses for half the time. 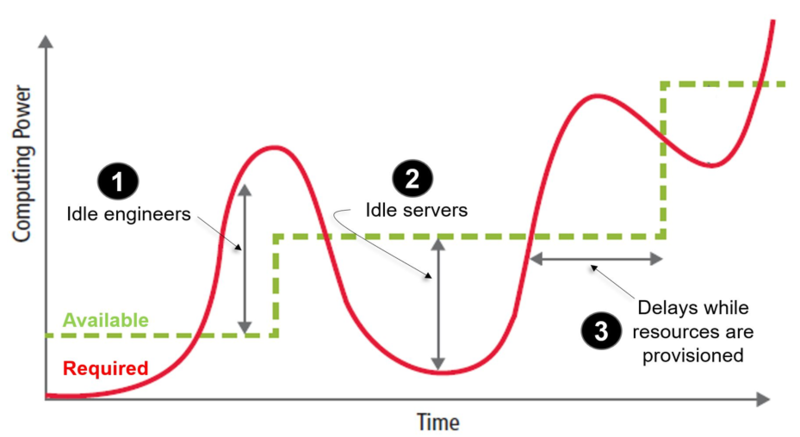 To the EDA vendor, it’s still the same total amount of seats/time, but if you could access twice the number of systems, you could run through the verification workload much faster and either catch issues sooner and/or have a little more time to address them. The cloud also gives the opportunity to access machines you may not have in house. If you need a couple of 2 TB ram systems for a particularly difficult run, you can access those types of systems in the cloud without having to buy them and wait for delivery and provisioning. When machines learning enabled EDA tools become generally available, they may need compute that isn’t already common in EDA centric data centers. If these tools need GPUs, FPGAs, etc. many of those are already available on the cloud. I recently joined Rescale as their semiconductor industry principal because they’ve already solved many of these and other deployment issues (cloud security, provisioning, management, tool orchestration, etc.) for successfully bringing adjacent and similar HPC workflows to the cloud. I don’t foresee many people in semiconductor going all in to the cloud, but a gradual motion is likely. In EDA the old amortization models of amortizing hardware over 3 years no longer fits for my company..The FinFET designs from last year stress the compute resources requiring considerable new hardware to meet time to market or customer commitments. The largest demand is during the “tapeout” process. The estimation is that next year this will be worse. The Cloud bursting we have done avoided considerable 3 year commitments for the short term “tapeout” need.